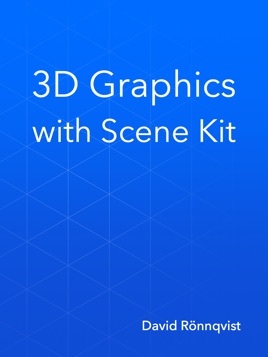 3D Graphics with Scene Kit is a book about Apple's high-level 3D rendering framework for OS X and iOS. It covers general concepts in 3D graphics and how they apply to Scene Kit. 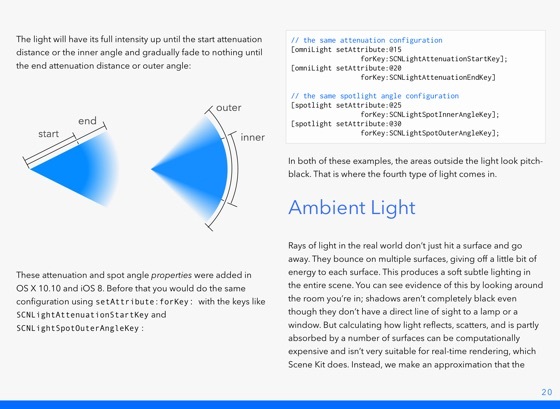 Scene Kit is a high-level, Objective-C framework for 3D rendering. It is a peer technology to other graphics technologies like Core Image and Core Animation. As an OS X or iOS developer, this means that you get to work with a lot of familiar concepts and frameworks. Scene Kit is built on top of OpenGL (Open Graphics Library), the open standard for 3D graphics. Even though it’s a high-level framework, it allows you to drop down to lower abstractions when you want more detailed control, all while still using higher abstractions everywhere else. In the first few chapters, this book covers foundational concepts in 3D graphics, such as scene graphs, lighting, and textures, and shows how to organize your scene, animate its content, and configure its appearance. If you've never worked with 3D graphics before, this will be a gentle introduction. It builds on that foundation by adding user interaction and integration with other Cocoa frameworks. 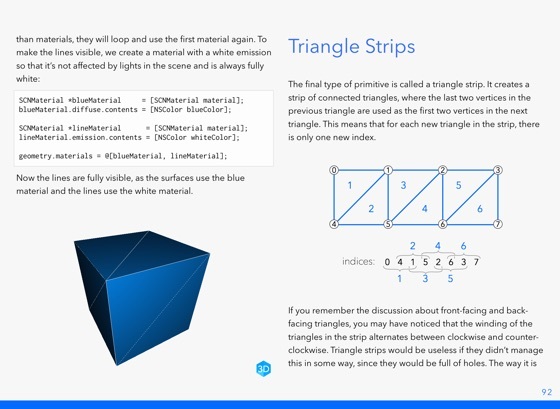 To introduce more advanced topics, it goes deep into how triangles are used to display geometry in 3D graphics, and teaches you how to create your own geometry in Scene Kit. 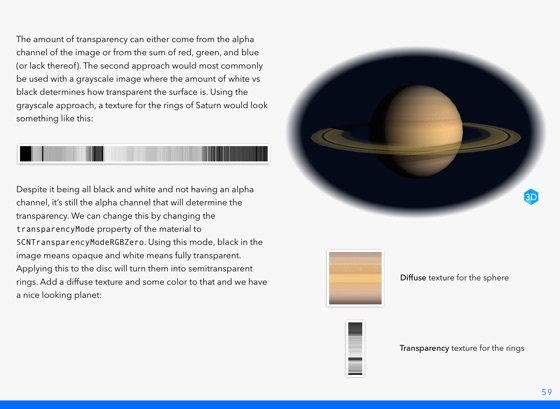 In the later chapters of the book, pieces of OpenGL are introduced, a little at a time, to customize the rendering in ways that wouldn't be possible using just light and material configurations. 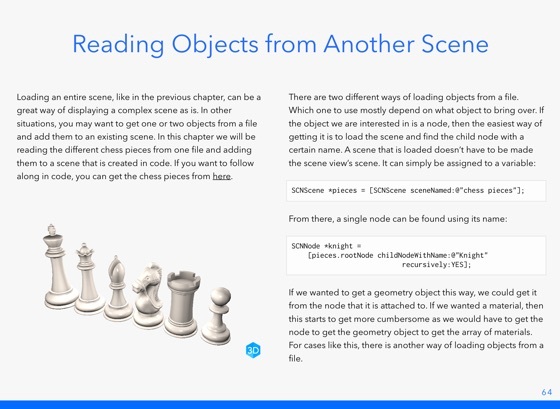 3D Graphics with Scene Kit is an interactive book, with embedded 3D objects on the page next to the explanatory text. It's intended to be both fun and illustrative. I sincerely hope that you enjoy it as much as I do. It is the best Scene Kit book out there. Actually it is also a good book to learn OpenGL. It explains the concepts and terminologies of computer graphics in a way that is easy to understand and remember. The design of book is excellent. The 3D models in the book helps learning. David did an amazing job to pack a lot of information in about 150 pages. It is one of the best 3D graphics books I’ve ever read. It uses Objective-C. 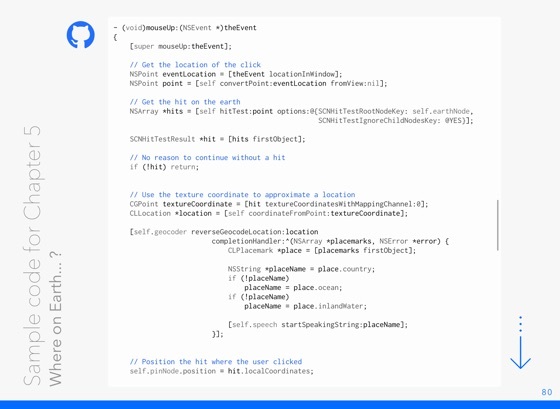 However, the knowledge and techniques apply to Swift as well. I rewrote all the sample codes in Swift, as playground, OS X app or iOS app. If you try to do this as well, you could discover some interesting aspects of Swift, and platform differences. I bought the book based on good reviews and the fact the author state on his site that this book will be updated. However, it’s clear that the author gave up and never updated or added any content. In the book in the current state he says it’s only the beginning but never added any content later. Ho and yeah: a lot of the code will be a mess to get to work with Swift and latest API as so many things changed since 3y. This book shouldn’t be for sale anymore in the current state. The author is clearly leaving it here to trap some ppl like me and get a few more bucks based on falsed promises. This book is still the best resource for learning SceneKit. The source code is out of date, but I was able to port the examples to Swift with a little effort.